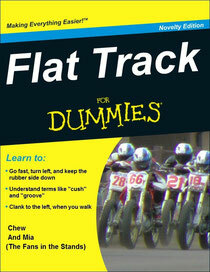 We want to welcome everyone who is just discovering flat track. Here are some of the common questions we hear, from first-timers. If you have a question that isn't on here, please feel free to email it to us at naturegirlmia@yahoo.com. Q: What do the different letters mean, on the numberplates? Once a rider qualifies for a main event, at a National, they are able to use a number with no letter. The rider with the number 1 is last year's champion... the one who gained the most points during the races. Any single digit numbers (minus letters) are reserved for prior champions. Q: What do the different colors of flags mean? A: The checkered flag, obviously, is the one that indicates the end of the race. In some cases, it is also used to start the race... however, many events have switched to a light system, instead. The green flag is used, after the first full lap, to let the riders know that the race is ON! The black flag is waved whenever a rider is being motioned to pull off of the track... usually for mechanical problems. A blue flag indicates that a rider is about to be lapped. This way, the slower rider can move up out of the racing line and let the others pass, safely. A yellow flag warns riders to slow down, hold their position, and watch for hazards. This is used when a rider goes down, but is getting back up... when a bike part or other object is on the track... and to indicate the end of practice laps, when riders are returning to the pit area. A red flag tells the riders to STOP. This might indicate that somebody "jumped the line" at the start, that the track needs prepped, or that a rider is down and not clear of the racing line. When the red flag falls, riders are required to slow down, holding their position, and slowly return to the hot box area or starting line (depending on the indication given by the crew). The white flag with the red cross signals the medical crew to come out and check on a fallen rider. Q: How does the racing program go? I mean, do they just line up and race? A: Oh, Heavens, no... there's a lot more to it, than that. 1. Three practices. The first practice isn't timed... it's just a way that the riders can get a feel for the track, and figure out where their race lines are. The last two practices ARE timed. The results help narrow the field to the top riders, who will race in the Heats, and indicate which "heat race" each one will ride in. The fastest qualifier gets the pole position in Heat Race 1... the second fastest, in Heat Race 2... the third fastest in Heat Race 3... the fourth fastest will take second position in Heat Race 1... the fifth fastest gets the second position in Heat Race 2... etc. 2. Heat Races. The riders who finish in the top three positions (usually) of each heat get to race in the Main Event. Everyone else has to run in the Semi. 3. The Semis. This is where everyone who DIDN'T earn a position in the Main during the Heat Races gets to go out and try for one of the few remaining spots. 4. The Main Event. This is the big one... the race that determines the night's winner. Sometimes there is also a Dash For Cash, in the lineup. This is a shorter race, taking the Expert riders who finished in the top two positions during their Heats, and putting them on the track to compete for some extra cash. Q: How are points scored? If there is a Provisional Start used, 1 point is also awarded for the rider who finishes in the 19th place spot. 1 point is awarded to the rider who wins the Dash for Cash. Q: What is a "Provisional Start?" A: The top ten GNC1 riders (from last season) each receive one Provisional Start Card, that will allow them to compete in a Main (from the penalty line), even if they didn't make it to the program through the Heat or Semi. If more than one rider wants to use their card, the Referee will choose the rider who has the most points. If it's the first race of the season, the decision will be based on the final points from the past season. Q: I don't understand a lot of these words and terms! Bul or Bull - Bultaco. CC - Cubic centimeters. This refers to the engine displacement (how much space/volume is swept out at each stroke, by the engine piston. Corner Workers - People who are stationed at strategic points around the track in order to alert the riders to hazards and cautions through the use of hand gestures and colored flags. Crumblies - Loose, scattered dirt, usually on the outer edge of the track. Cushion (or Cush) - A thicker layer of dirt, on the track's surface. DNF - "Did not finish." This usually indicates that a rider was unable to finish an event (most often, because of a mechanical problem or crash). DNS - "Did not start." The rider was unable to compete, from the starting line. DQ - Disqualification (or, DQ'd, which means "disqualified"). This usually means that a rider is stripped of all points and awards for a particular race, usually because of an infraction of the rules. Draft - This is where two (or more) riders race in a single-file line, with very little distance between them. This creates an air pocket that boosts speed by a few miles per hour. Drafting for the Pass occurs when the rider in the back uses the draft to pick up enough speed to allow him/her to pass the bike in front of them. Flaggers - Another term for Corner Workers. Get Off - A crash, or TO crash. Groove - A hard-packed line that becomes visible on the track, usually "grooved" into the surface. On lighter-colored sand or limestone surfaces, it may appear as a Blue Groove. Heat - Shortened term for Heat Race (A race in order to determine which riders will compete in the Main, and what position they will start in). High-Side - A crash in which the rider is thrown from the top of the bike. Hole Shot - Taking the lead into turn 1, from the starting line. Homologation - Parity among bikes, set by rules, in order to maintain a more even field of competition between bikes. Kawi - Kawasaki. Also called a "Kaw." LCQ - "Last Chance Qualifying;" A race in which riders who did not secure a position in the Main during theirHeat are given a second chance to compete for a position. Also referred to as a Semi in some classes/events. Line - A path used to get around the track, or part of it. The line may vary between riders, or throughout the event, for many reasons... track condition, personal preference, etc. Line-up - The riders competing in an event, and the position they will be starting from. OEM - "Original Equipment Manufacturer." Open Pits - A time period which may be offered at some events, during which fans may go into the Pits to get autographs, meet the riders, and take a close-up look at the bikes and their preparation for the event. Paddock - An area where racers park to sleep, work on their bikes, or socialize before or after a race. Often, this is an on-site campgrounds or parking area. Pit Crew - The team of mechanics and assistants that help prepare and maintain the equipment, as well as offer other support and assistance to the rider. Pit Pooch - An affectionate term referring to the four-legged canine companions that travel with many of the riders or teams. Pit Tootsie - A term that refers to the female "groupies" who pursue racers. Pits - An area specifically reserved for the maintenance or preparation of the racing bikes. Usually, this also includes competitor parking, the Tech Inspection area, and an area where results and Line-up information is posted. Privateer - A racer who is competing without any major sponsorship or factory support. Program - The outline of events. It may refer to the actual itinerary or a magazine-type booklet sold to the fans as a souvenir. Qualify - To advance (or attempt to advance) into a Main through a Heat or Time Trial. Rider's Meeting - Also called Rider's Briefing. A meeting held before practice, during which the rules and procedure are discussed. Roostertail - A "jetspray" of dirt (usually pea gravel) that is flung from behind the motorcycles. Seize - Term used about an engine that fails due to too much heat buildup. Tear-Off - Thin strips of clear plastic, which the riders tape in layers over their visors. When dirt accumulates, and visibility gets bad, the rider will tear off the top strip and discard it. A clean strip will be left in its place. Thumper - A four-stroke motorcycle. WFO - Abbreviation for "Wide F-ing Open." Refers to the fact that a bike or rider is running at maximum potential. Whiskey Throttle - A reflexive response, when losing control of a bike, falling off, or such. The person reacts by tightening their fists in order to "catch themselves." This, in turn, causes them to tighten up on the throttle, often wrecking. Wrench - To work on a motorcycle. Also, another term for a mechanic.